With the announcement for AMD’s Radeon RX Vega and Ryzen Threadripper already done and dusted, you'd think AMD wouldn’t have much else to announce during its Capsaicin event. As it turns out, we were wrong. 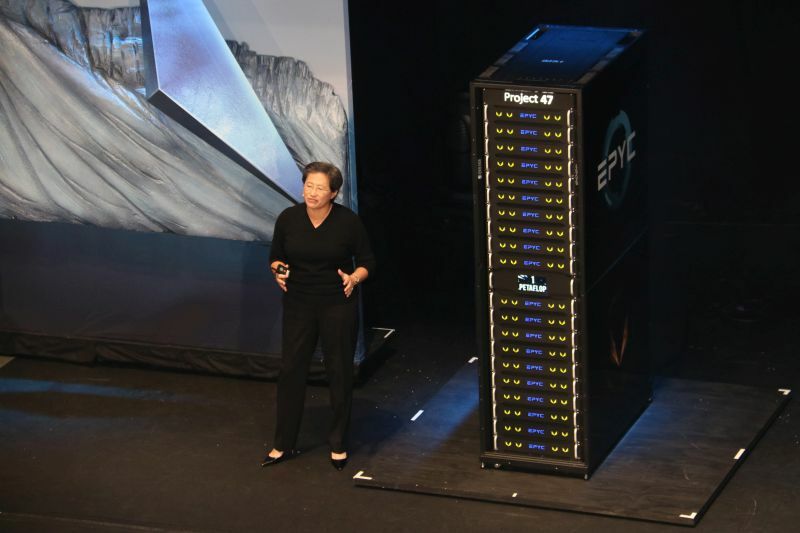 At the final leg of the company’s Capsaicin event, Dr. Lisa SU, President and CEO of AMD, gave the crowd a first look at Project 47, her company’s first server rack that is designed with one goal in mind: to produce one Petaflop of processing power. 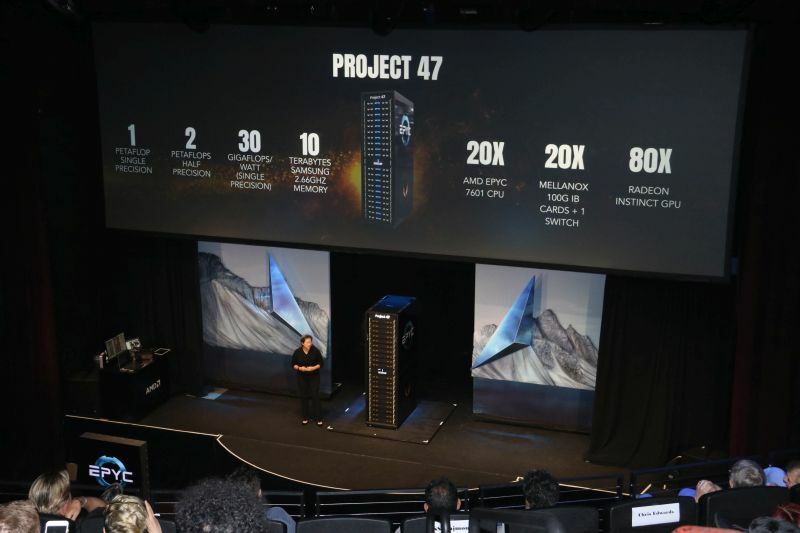 To drive this immense amount of power, Project 47 is comprised of 10 terabytes of Samsung 2.66GHz memory, 20 EPYC 7601 CPUs, 20 Mellanox 100G IB cards (plus one switch), and 80 Radeon Instinct GPUs. The end result of this is a server that is capable of providing one petaflop of single precision computing and two petaflops of half precision computing power. This isn’t AMD’s first foray in creating a one Petaflop supercomputer. Back in 2008, AMD and IBM had collaborated together to create IBM Roadrunner. 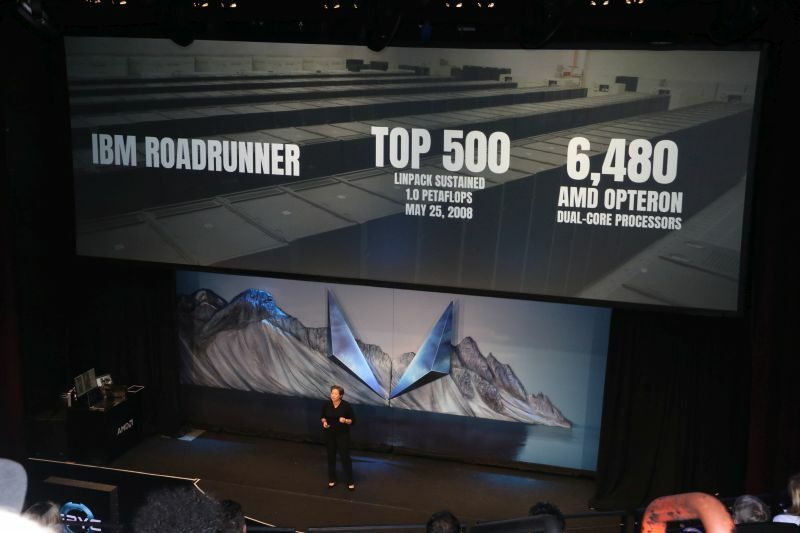 Back then, however, instead AMD EPYC CPUs and Radeon Instinct GPUs, Roadrunner was made up of a whopping 6,480 units of dual-core Opteron CPUs. As it stands, Project 47 is quite literally very new and undoubtedly the company’s new baby in the realm of machine learning, Deep Learning, and high-performance computing. Hopefully, we’ll hear more of Project 47’s adoption by some of AMD’s clients and partners in the following months. For more from AMD, follow us here.